"We are taught to think critically, and that obligation applies to days of celebration just as readily as days of gloom," the 2005 Truman Scholar said. "Today, on a day typically reserved for challenges of great magnitude, I use a unique challenge of my own. Be vulnerable, class of 2006, for strength breeds immutability; and weakness permits growth. Wabash should always fight, but it should fight against forces of strength that threaten to undermine a liberally educated mind." Flowers is a French and political science major. Active in student journalism throughout his time at Wabash, Flowers served as editor-in-chief of The Bachelor, Legalis, and The Wabash, and was chairman of the Board of Publications. He received the Robert S. Harvey Journalism and the Jim Leas Outstanding Student-in-Journalism awards in his junior year. 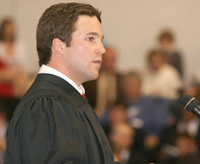 A member of Lambda Chi Alpha fraternity, he served in Student Senate and received the Lewis Salter Memorial Award, the Waldo Stephens Scholarship, the George A. Lipsky Award in Political Science, and the Joseph Daniels Award in the Philosophy of Law. He is the son of Charles and Loralynn Flowers. Chris Ogden spoke about "Wabash, its Traditions, and the Next Generation of Heroes." Ogden talked about the challenges of Wabash College. "One thing I’m absolutely sure of is that this school challenges people," he said. "It gives us challenges that push us to our limit and even makes us question if we have what it takes. Some of the time, things go wrong, and we don’t meet a challenge. But a lot of the time we succeed. We rise up, surprising even ourselves, and accomplish something we would never have imagined. It is these special, and in a way, defining moments, that teach us why we should always fight." "Our Wabash education gives us a responsibility to care and to participate in the issues of the world. We have learned to think for ourselves, to debate, to speak our minds, and to act. I believe our success comes down to how we approach life and the simple choices we make. We can choose to have an opinion on the issues. We can choose to live humanely. We can choose to love our families with all of our hearts. We can choose to touch lives of the people around us. We can choose to live life with enthusiasm. And we can choose to hope and believe that we can make the world a better place. We can make these choices. And these choices should be how we define success and measure a Wabash hero. We can all be Wabash heroes. It is a choice we make." Ogden is an economics major from Schererville, Indiana. A four-year member of the Wabash College football team and winner of its Scholar Athlete Award, Ogden is also a member of Sigma Chi fraternity. 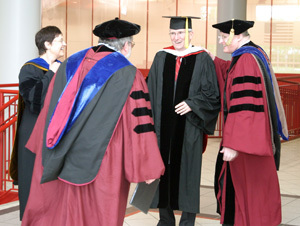 He received distinction on his comprehensive examinations and was inducted in the Wabash chapter of Phi Beta Kappa. 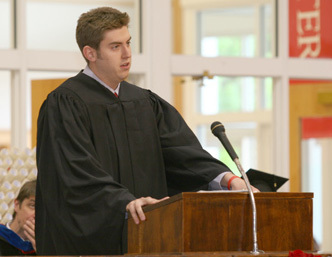 While at Wabash, he received the Senior Award of Merit, the Wall Street Journal Award, the Warren Wright Schearer Award in Economics, the Dean Stephens Award, and Scholar Athlete Award from the Indianapolis Association of Wabash Men. He is the son of Kevin and Noreen Ogden. After President Ford conferred honorary degrees on Bruce R. Baker and Alexander A. Miller the Class of 2006, the Board of Trustees had a surprise for the retiring President. Clearly caught off-guard, Ford watched as Dean Raymond Williams read a citation and the College bestowed an honorary degree on the College’s 14th President. Baker was graduated from Wabash in 1965 and later did his graduate work at Middlebury College, Indiana University, and the University of Paris. He has spent his life as teacher, innovator, and entrepreneur. He has taught at Saint Francis College and Frostburg State College, and is currently an adjunct member of the faculty at the University of Pittsburgh. Drawing from the Latin and Greek he learned while at Wabash, Baker developed technology that allows severely, physically disabled people to communicate effectively. Using ancient hieroglyphics as his model, his Minspeak device turns pictures into words, which has allowed thousands of previously speechless people the world over to communicate. His firm, Semantic Compaction Systems, has developed Minspeak for use in nine languages with Asian languages currently in Development. He also founded and funded a non-profit corporation that studies employment issues for people with significant physical impairments. Baker also has been generous to his alma mater, establishing the David O. Justice Chair in Economics in the Campaign for Leadership. Miller was graduated from Wabash in 1971 and joined the United States Navy. Over the last 35 years, Miller has kept the Navy on the cutting edge of modern technology in signal intelligence, targeting US enemies’ communications and radar signals. He served on four submarine deployments in the Western Pacific Ocean; was the commanding officer of the Naval Security Group Activity in Athens, Greece; and commanded 650 Sailors and Marines performing signals intelligence in the Northeast Pacific. He served as Chief of Staff to the Director of the National Security Agency, leading the transformation NSA’s National Cryptologic Systems, and eventually earned the rank of Rear Admiral. He has earned master’s degrees from the University of Oklahoma and Georgetown University, and attended Harvard University as a Senior Executive Fellow. The United States Navy has awarded Admiral Miller the Defense Distinguished Service Medal, Legion of Merit, Defense Meritorious Service Medal, Navy Meritorious Service Medal with three Gold Stars, and the Navy Commendation Medal with Gold Star, among others.